HELMAND PROVINCE, Afghanistan – – Most people would be hesitant to rush head-long into a burning building, risking their own safety to ensure the safety of others. 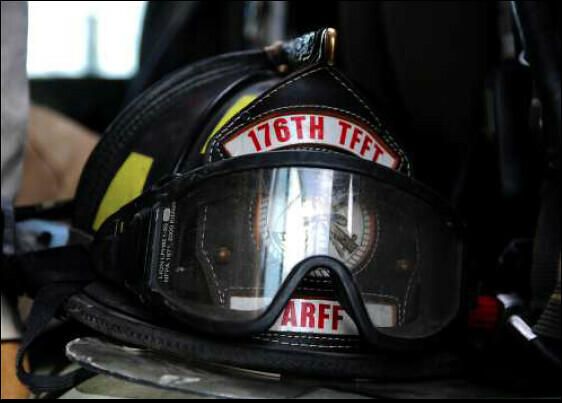 The Soldiers of the 176th Fire Fighting Team, Camp Stone Detachment, not only rush in to the fire, they train others to do it as well. 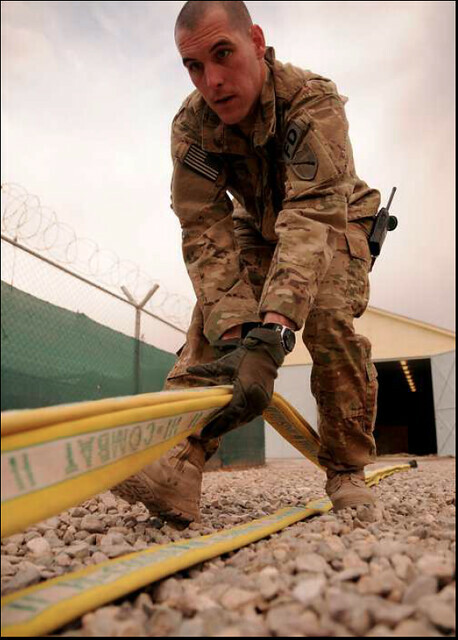 Deployed from their Army National Guard unit, based in Greenville, Ky., the unit was initially assigned to Camp Bastion, Helmand Province. Only spending one month at Camp Bastion, the team was initially sent to Camp Stone, in the western region’s Herat Province, to provide support for the air operations at the camp. One of those needs was as trainers for the Camp Stone volunteer fire brigade. After several fires on the camp and at neighboring facilities, the need for a fire brigade became evident and volunteers answered the call. The arrival of the 176 FFT several months later provided the volunteers the opportunity to learn from professionals and the firefighters the opportunity to hone their training skills. 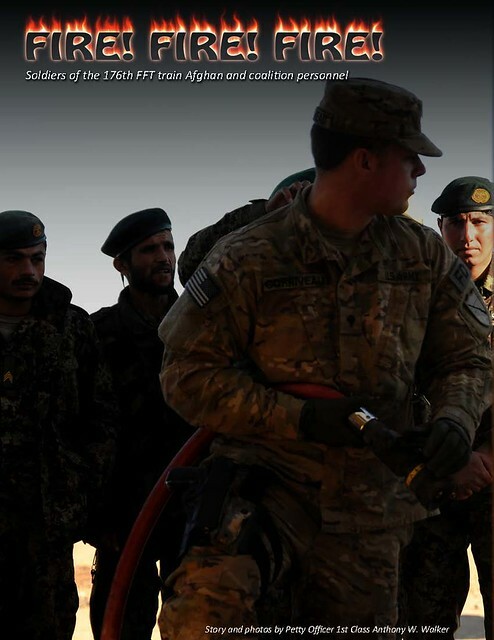 The training experience would better prepare the Soldiers of the FFT for their next opportunity, training the Afghan firefighters on neighboring Afghan National Army (ANA) Camp Zafar. 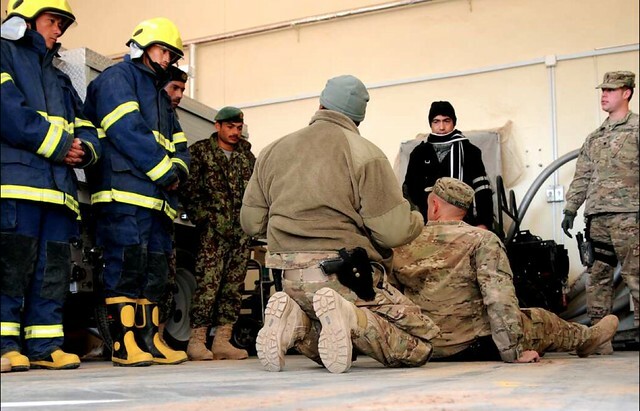 Training with the Camp Zafar fire department was not only helpful to the Afghans, the fire team also found the experience rewarding. The deployment, the first for the unit and most of the junior members, also gives junior firefighters valuable organizational experience. “This is the first deployment for a lot of the guys,” said LaFortune. “When we arrived, there was no established fire department, this has given our younger guys the chance to learn first-hand how to set up and organize a working fire house.”The organizational experience, coupled with the training experience will serve the team well in their future endeavors as firefighters, both in the military as well as on civilian departments.Following a hard day of grueling missions, the Soldiers, Sailors, Airmen and Marines of Camp Stone will be able to rest a little easier knowing the selflessly dedicated Soldiers of the 176 FFT have the watch while they sleep.